Lloyd and Jobya Ralston in The Freshman. I think I've mentioned in this blog before that sometimes I 'm loathed to dig into the work of an actor that I haven't seen before. It's usually not because I'm afraid I won't like it but, dang it, with my obsessive personality, I'm afraid it will add to an already over-burdened tivo queue. That didn't stop me from taping a couple of Harold Lloyd movies last week or from trotting them out during tea time with my family over the week-end. So yeah, hello, Harold Lloyd. Hello, new obsession. And good-bye to a few gigs of storage. 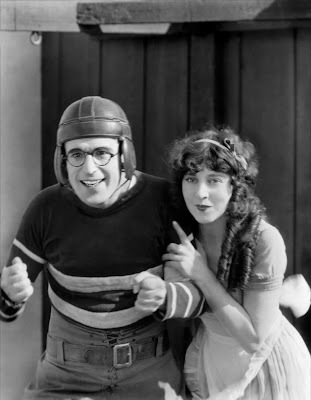 I think that Harold Lloyd's movies are so infectious because they combine acrobatic slapstick with a romantic comedy plot. It's not enough that Harold has to defy death hanging from a clock tower in Safety Last (1923) or become an unwitting football hero in The Freshman (1925). He has to get the girl as well and though it may seem like a small thing, it's really everything. This plotting makes Lloyd's movies seem more modern than other silent comedies. Most people remember the famous building climbing sequence in Safety Last. It takes up the final third of the movie and is memorably spectacular. I actually enjoyed the proceeding two thirds of the film more, where Lloyd was a hapless department store clerk trying to impress his girl who mistakenly believes that he is the general manager. The film was sweet and consistently funny as Lloyd tries to dodge his manager and supervisor, still do his job and find ways to convince his sweetheart that he's in charge of the whole store. Safety Last was not only ground breaking because of its physical comedy, it was ground breaking because it was one of the first romantic comedies on film. The form has been around at least since the Greeks, but because of the requirements of dialog, it wasn't something that was very doable in the world of silent film. Lloyd's comedy is mostly visual, but there is a certain amount of verbal wit that is relayed through the inter-titles and aided by sound effects that were written into to the story. One doesn't think much about the writing in a silent film, but Hal Roach who did the screenplay for Safety Last, does a great job of getting the story and jokes across with relatively few inter titles. It's an amazing exercise in efficiency and there are plenty of throwaway pieces of dialog that you can see the actors mouthing that aren't given title cards. It's a given that we don't really need them. His films are also topical which gives them a less universal, more grounded feeling. Safety Last exploits the building climbing stunts that were popular in the 1920s (a fad which has come back with the popularity of Alain Robert) and The Freshman lampoons all things collegiate. In the later film, Lloyd plays a young man who goes to see a movie called "The College Hero" over and over, memorizing the dialog and studying the actions for use in his own freshman year. The hero of "The College Hero" is named Speedy and Lloyd's nickname at school soon becomes speedy as well. A few years later Lloyd made a movie entitled Speedy (1928). The overlapping of fictional and real-life in Lloyd's world is intense and his characters often have the first name "Harold" or the last name "Lloyd." Harold Lloyd's movies look terrific for their age. This is due in part to the fact that Lloyd used a fair amount of his personal fortune to preserve his own films. We are left with 11 silent feature films and dozens of shorts, many of which look pristine and feel more contemporary than almost anything else (with perhaps the exception of some of Lon Cheney's work) in the era. I once spent a month figuring out how the stunts were done in "Safety Last." It's like figuring out magic tricks; one is a little disappointed in the end. Today, of course, it would all be done with CGI - which similarly ruined Mike Jitlove's film "The Wizard of Speed and Time" in the 1980's; I recommended it to people, who all thought it was done by computer, rather than stop-motion. BTW, I always preferred Charlie Chase to Lloyd, even though he was nowhere near as talented - like preferring the Ritz brothers to the Marx brothers. For me stunts are successful when you believe in them, even if its just for the time while you are watching the film. Certainly Safety Last meets that criteria and then some. Unfortunately that feeling is almost impossible now with CGI. Action movies have gotten louder, noisier, faster and less interesting as a result. I didn't know that anyone liked the Ritz Brothers more than the Marx Brothers, except perhaps, the Ritz Brothers.